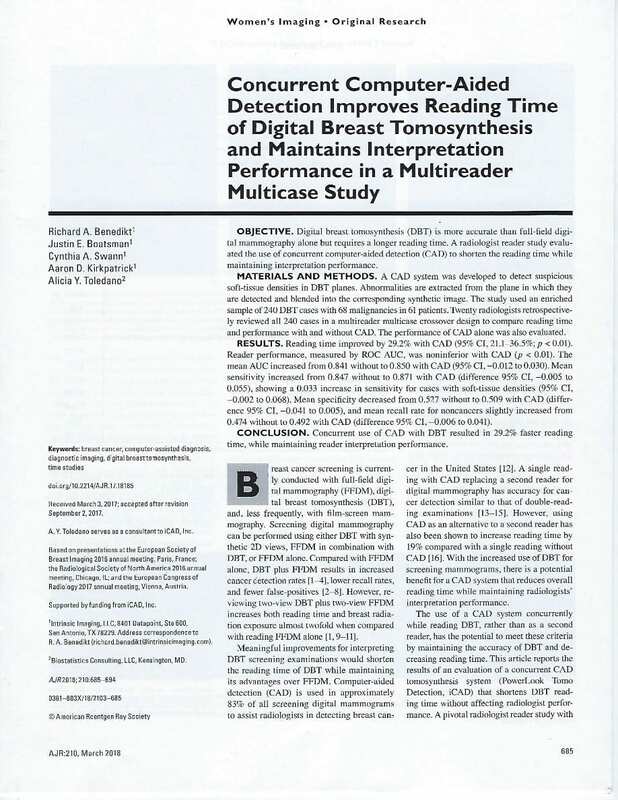 Intrinsic Imaging is the world leader in conducting multi-case multi-reader studies to evaluate Artificial Intelligence (AI) and Computer Assisted Detection (CAD) systems. We provide the most efficient means for Sponsors to conduct trials to assess the clinical performance of their AI/CAD software and obtain FDA clearance. To have Intrinsic Imaging manage your AI/CAD clinical trial, please contact Intrinsic Imaging at [email protected] or call us at 1-978-798-2400. Study A was a fully crossed, MRMC AI/CAD study with no wash-out and consisted of a total of 12 readers in 2 Group Cohorts, 240 cases and 5760 reads. Intrinsic Imaging underwent a 5-day routine FDA audit with zero 483 and the CAD software was subsequently cleared by the FDA as a PMA Class III medical device. Study B was a fully crossed, MRMC AI/CAD study with a one month wash-out and consisted of a total of 20 readers in 4 Group Cohorts, 240 cases and 9600 reads. This study was a success and the CAD software was subsequently cleared by the FDA as a PMA Class III medical device. Study C was a MRMC musculoskeletal device trial to evaluate the efficacy of a spinal implant. This MRMC retrospective study consisted of a total of 28 readers and over 20,000 reads. This study was a success and the medical device is cleared in Europe and awaits clearance by the FDA as a PMA Class III medical device. A recent routine FDA audit of the study resulted in zero 483 findings. Study D was a fully crossed, MRMC AI/CAD study with a one month wash-out and consists of a total of 21 readers in 3 Group Cohorts, 350 cases and 14,400 reads. This study is on-going. Once completed, this study data will be submitted to FDA for clearance as a PMA Class III medical device. Study E was a fully crossed, MRMC AI/CAD study with a one month wash-out and consists of a total of 14 readers in 2 Group Cohorts, 320 cases and over 8960 reads. This study is on-going. Once completed, this study data will be submitted to FDA for clearance as a PMA Class III medical device. Intrinsic Imaging clinical trials are conducted within Intrinsic Imaging’s ISO Certified quality management system framework. With our portfolio of five ISO certifications certified by the British Standards Institute, Intrinsic Imaging has the most comprehensive and sophisticated quality management system in the industry. Dr. Amit Mehta is Vice-President and Chief Medical Officer at Intrinsic Imaging. Dr. Mehta is a board-certified fellowship trained radiologist. Dr. Mehta completed his residency in Diagnostic Radiology at Harvard Medical School’s Massachusetts General Hospital, where he also completed a fellowship in Vascular and Interventional Radiology for which is possesses a Certificate of Additional Qualification by the American Board of Radiology. He has co-authored three textbooks in Radiology, has widely published in peer-reviewed journals for which he now serves as a reviewer and currently is appointed as a SBIR/STTR reviewer for the National Institutes of Health. He was selected in 2010 as one of the “Top 40 under 40” by the San Antonio Business Journal. Dr. Richard Benedikt is a board-certified fellowship trained radiologist at Intrinsic Imaging. He completed his Diagnostic Radiology Residency at Walter Reed Army Medical Center where he was Chief Resident. He served as Chief of Thoracic Imaging and Chief of Ultrasound at Brooke Army Medical Center. Dr. Benedikt was previously a research fellow at McLean Hospital (Harvard Medical School) for two years. Dr. Benedikt has participated in clinical trials for over 15 years and he has authored or coauthored over 15 publications. He has completed human research trials as well as clinical imaging research and he is a manuscript reviewer for two major radiology journals, AJR and JACR. Dr. Benedikt also holds an MBA from the University of Texas. Mr. Bryan Wayne BSc. is Vice President of Imaging Operations at Intrinsic Imaging. Mr. Wayne specializes in providing imaging core lab services in support of Phase I-IV Clinical Trials and Class I, II and III Medical Device Trials. Mr. Wayne has over 15 years of experience in providing medical imaging core lab services and he has a proven record of managing international clinical trials across all therapeutic areas and indications. Prior to joining Intrinsic Imaging, Mr. Wayne was a senior manager within PAREXEL, one of the world’s largest contract research organizations. At PAREXEL, Mr. Wayne managed large complex clinical trials within the medical imaging division. Mr. Wayne holds a Bachelor of Science degree from the University of New Hampshire. Prior to joining Intrinsic Imaging, Mr. Warpula was most recently Senior Manager of Global Quality Assurance at Waters Corporation (NYSE: WAT) which holds worldwide leading positions in analytical instrumentation. At Waters Corporation, Mr. Warpula implemented several key improvements which demonstrated success in the areas of; clinical product quality and manufacturing, Quality system implementation, post-market surveillance, and technical product management. Mr. Warpula was previously Associate Director of Quality Operations at Baxter and Associate Director of Quality Systems at Genzyme Sanofi where he directed several quality initiatives that lead to continuous improvement and compliance of quality systems for Phase III clinical trials, cGMP commercial drug manufacturing and final drug product release. Mr. Warpula holds a Bachelor of Science degree in Business Administration. He is a Certified Quality Auditor of the American Society of Quality (ASQ) and is a certified ISO 13485 Lead Auditor. Mr. Heekwan Lee is the Director of Data Management at Intrinsic Imaging. Mr. Lee has 20 years of experience in providing imaging core lab services on clinical trials. Prior to joining Intrinsic Imaging, Mr. Lee was an imaging specialist within PAREXEL, one of the world’s largest contract research organizations. Mr. Lee is experienced with all aspects of site qualification and training throughout Europe, North and South America, and East Asia. Mr. Lee is an expert in the development of standardized imaging guidelines. Mr. Lee holds a Bachelor of Science degree in Biology and Mathematics from Northeastern University. Mr. Matthew Barnes is an Associate Director at Intrinsic Imaging where he manages international clinical trials for Pharmaceutical, Biotechnology and Medical Device companies. Prior to joining Intrinsic Imaging, Mr. Barnes was a project manager within PAREXEL, one of the world’s largest contract research organizations. At PAREXEL, Mr. Barnes managed complex trials across all therapeutic areas and indications within their medical imaging division. Mr. Barnes holds a Bachelor of Science degree in Biotechnology from Worcester State University and a concentration in Nuclear Medicine from UMass Memorial Medical School.